The NCAA banner marking the 12th national team championship for the Michigan Wolverine men's swimming and diving team has arrived at Canham Natatorium. 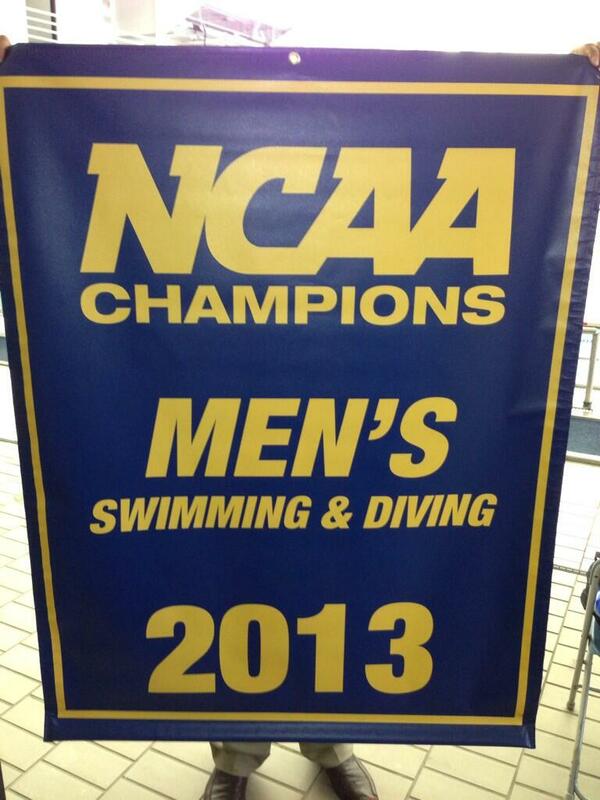 The NCAA Championship banner marking the 12th national team championship for the Michigan Wolverine men’s swimming and diving team has arrived at Canham Natatorium, as shown above in this photo Tweeted by associate head coach Dr. Josh White. The win was the first for the Wolverines since 1995, and just the second title from a Big Ten squad since the legendary Doc Counsilman won his final title at Indiana in 1973. It’s been a big year for the Michigan. After finishing the dual meet season with a number one team ranking, the Wolverine men stormed into Bloomington, Indiana and won their third consecutive Big Ten championship in dominating fashion, topping runner-up Indiana University by 235 points. They returned to the Hoosier State a month later for the NCAA Championships, where they kept the two-time defending champion Cal Bears at bay en route to their 12th NCAA title (first since 1995). While the men have to replace eleven huge relay spots from seniors Miguel Ortiz, Sean Fletcher, and Zach Turk, they are still in great position to contend again next year: on paper, the Wolverines are returning at least 50 individual points more than any other team.